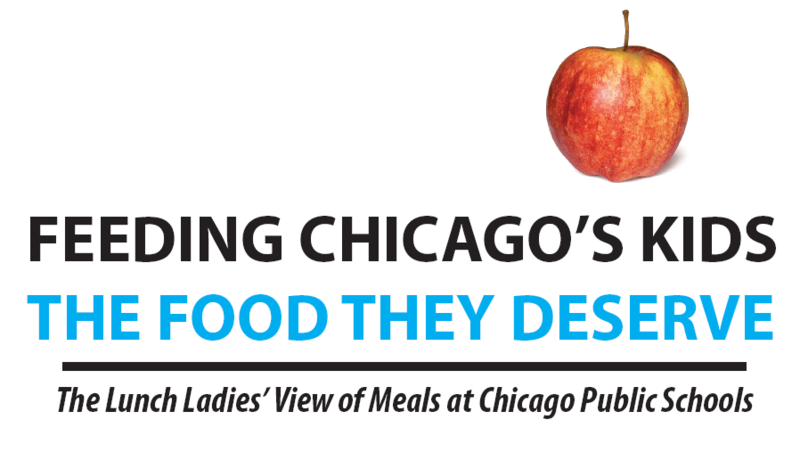 We are the 3,200 frontline workers who prepare over 77,000 school breakfasts and 280,000 school lunches each day for the children of Chicago in over 600 schools. We are also the grandmothers, grandfathers, mothers, and fathers of thousands of Chicago Public School students. Who knows better than the lunch ladies, right? I also bet that not getting a chance to share your thoughts about the food would be pretty disenfranchising — the opposite of empowering. 73% of those surveyed thought food at cooking schools was superior to frozen food schools. Let’s get lunch ladies the training they want and need to make our schools healthier. Actively solicit and incorporate their input in school food improvement. Make a commitment to cooking, which means CPS must agree to: a) Avoid replacing cooked food with frozen food b)Build full-size cooking kitchens in all new schools. Help lunch ladies reach their full potential as caretakers — they want comprehensive training on cooking, serving and eating healthy food. Encourage lunch ladies to keep students and parents informed if they believe there is a problem with food quality or safety in the cafeterias. The lunch ladies have spoken (Source: Real Food, Real Jobs). Now let’s hope that the people in power are listening. I don’t want to be over sensitive, but I generally disagree with the use of the term “lunch ladies”. Primarily, there are men in many school lunch rooms. But in addition to that, the term “lunch ladies” is demeaning. If we are hoping to give more power and control to create healthy food to school cafeterias, the workers must be recognized on a higher level. “Lunch ladies” has so many negative connotations from childhood movies and media- its associated with the kind of eating that we are trying to get away from, mystery meat and overcooked vegetables. At our school we say either “cooks” or simply “workers”. I remember YEARS ago, when I was in grade school, our school cooks (all ladies) were fighting to keep fresh food in our lunch menus. My friend’s grandma was the head cook. We had a full kitchen in our little country school. Every day they made everything fresh – soups, sandwiches, desserts. We always had a vegetable that we HAD to take and we HAD to eat if we wanted seconds. The main meal might have come prepared, but they were fresh. Meaning, we had burger patties but they were never frozen. Dessert was always freshly made. I loved it when they baked cookies – but fresh bananas and vanilla pudding were a second favorite. We always saw teachers/principal eating – even though they had their own room. The district/state began telling them they had to use prepared food/stop cooking and the cooks began to fight back. These were “country moms” who were used to making everything from scratch for their families. We at the school were their families. From what I’ve heard, the elementary schools in my home town still make things from scratch (at least two of the three). Not sure about the middle or high school. I just finished your book. Inspiring. I spend quite a bit of time in my daughter’s elementary school cafeteria. A group of parents initiated deep recycling and composting in the school. We are working hard and have lots of help from the principals, food director, janitors and kids. Reading the book showed me how good we have it. Our kids come straight to lunch from recess. The lunch director is really trying to give the kids healthy options, whole wheat breads and pasta, fresh fruits, sweet potato fries substituted for french fries. There is still a lot of waste. At home, I love cooking with great ingredients from local farms. Check out my green “green” enchiladas. Thanks so much! I really appreciate your thoughts. There is a lot of food waste. It’s appalling…. Pingback: School lunch rules | What's for lunch?